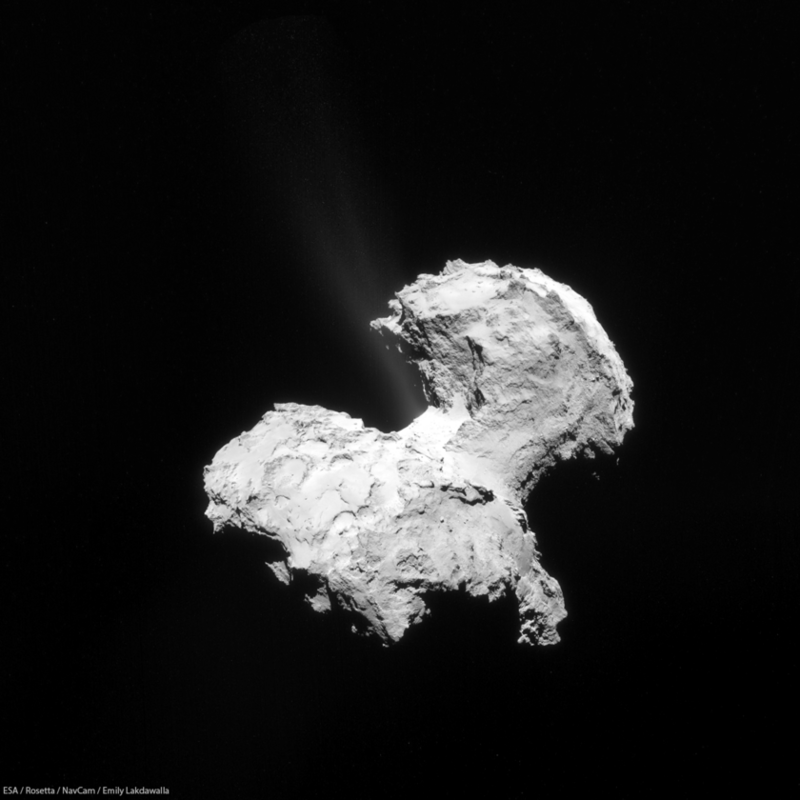 A four-image mosaic of comet Churyumov-Gerasimenko taken by Rosetta on September 2, 2014 clearly shows at least two jets emanating from the "neck" region of the comet. Comets are a tricky but fun image processing challenge, because at lower phase angle (with the Sun more or less behind the spacecraft) the nucleus is much, much brighter than the coma. The standard brightness and contrast adjustments I do to photos of space objects would completely wipe out the jets. To make a single image that shows both nucleus and coma or jets, I usually process the coma separately from the nucleus and then paste a brightened coma in to the image; in this case I focused only on the two prominent jets near the neck. But this image doesn't tell the whole story. Here is a before-and-after comparison that shows what happens when you really crank up the brightness of the original images. You see those two very prominent jets near the neck, but there are two other regions close to the nucleus where there seems to be some enhanced brightness over the background level. One of them is a broad, diffuse area to the lower left. That one I'm sure is real. The other is a slightly narrower region of enhanced brightness to the right of the neck area. That one happens to lie along the boundary between two image frames, so I can't be completely sure we're looking at a real effect instead of just a processing artifact. 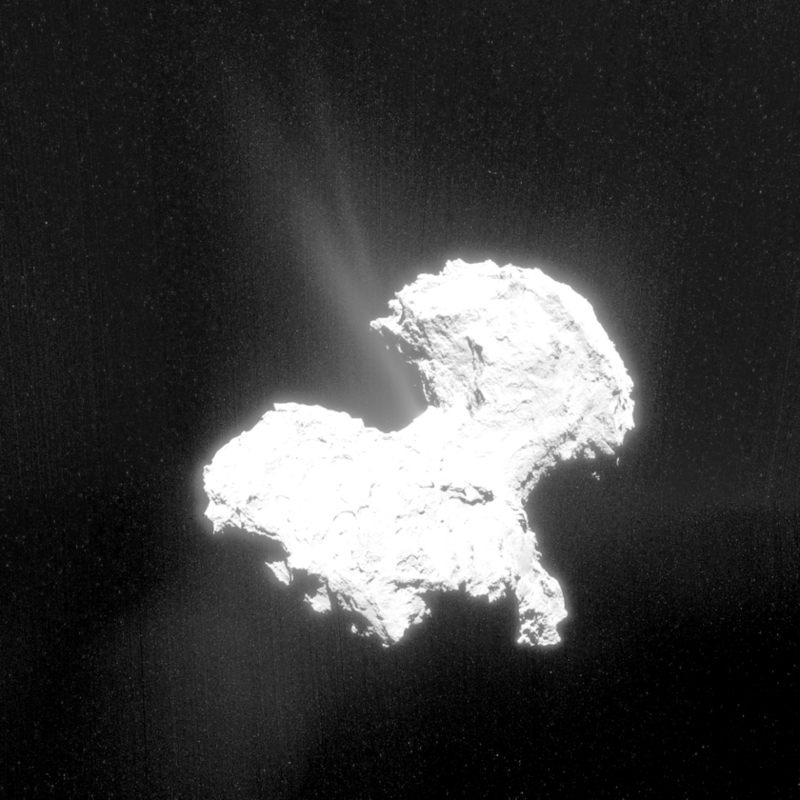 Adjusting the brightness of NavCam images reveals jets emanating from the comet. There are two jets clearly visible at the neck, but there is also a brighter background near the "body" of the comet at lower left, and a possible area of enhanced brightness to the right of the comet. I made the four-image composite using a tool that's new to me: Microsoft Image Composite Editor. It is fantastic -- I think it may be my go-to tool for image mosaics from now on. It handily merged these images, while Adobe Photoshop Photomerge choked on them. Microsoft ICE can input and output 16-bit data, and it outputs lots of different image formats, including Photoshop PSD. But before I brought the images into ICE, I first corrected a rhythmic striping I had noticed in the original NavCam frames. I hadn't noticed this striping before -- it only became visible when I radically increased the images' brightness in order to bring out the jets. I corrected the striping using the same technique I described for correcting interline transfer smear in Curiosity MAHLI images. There was probably some overcorrection there -- I know I lost some of the coma effects I was looking for -- but it did the job quickly; I'll wait to do a more careful job until I can get my grubby hands on archival-quality data. This is good enough for work with raw JPEGs! Thanks; absolutely fascinating. I wish that ESA was more proactive itself. Based on the slow release of images, I think Rosetta is already in a coma. Excellent! Yes, 16-bit-worthy Microsoft ICE can do!